The Bourne and South Lincolnshire ME Support Group will be running a stall for ME Awareness and to raise funds. Bourne and South Lincolnshire ME Support Group stall to raise ME profile during ME Awareness Week. The group produces a newsletter and runs a telephone helpline as their members are scattered around the region and it can be difficult for them to attend regular meetings. Membership is free. We use a little of the money we raise to fund the Helpline and the Newsletter, but most of it is sent to support research. This is vital in order to find what causes the illness so that effective treatment can be achieved. There is some very promising research going on at the moment into gene expression, which it is hoped will lead to a definitive test for the illness and eventually to better methods of treatment, but it is not supported by the Government and has to look to groups such as ours for funding. The Dorset ME Group has a fundraiser and a social event planned for May 2009. Then later in the month a social event with tractor driven trailer rides. Dorset ME Group social event. Dorset ME Group have link groups in Weymouth, Dorchester, Bridport, N.Dorset, Wareham, Purbeck, Christchurch, Bournemouth, Poole & Wimborne. They provide support for ME sufferers in the region. They organiseregular meetings, a twice yearly newsletter and an Annual Medical Lecture, open to all interested in CFS/ME. On 9th May 2009 there will be a Gift Auction in aid of the New Jersey Chronic Fatigue Syndrome Association (NJCFSA). 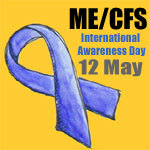 The group is run by persons with CFS and their famillies to support persons with CFS. at VFW Post 2639, 1515 Corlies Avenue Neptune, NJ. Admission includes 1 sheet of regular-basket tickets, coffee, tea and cookies. The NJCFSA also sells blue ribbon enamel pins/badges at $3.00 each plus $2.50 shipping and handling. Plus they have a poster that can used for campaigning. Please see the NJCFSA web site for more details. The second Walk of FAME for the National Fibromyalgia Association (NFA) will be on Tuesday 12 May. Hundreds of walks will happen in local communities nationally and worldwide. There will even be a virtual walk to join. On or around May 12, teams of three or more, patients, family and friends —wearing Walk of FAME T-shirts and equipped with information cards—will walk at an array of popular destinations, including shopping malls, the perimeter of Disneyland and high profile college campuses. The registration fee for the Walk of Fame is $35 which includes a pack with a t-shirt, information cards and more. Proceeds go to the NFA.